Since the accidental death of Petula’s younger sister, Petula has tried to game the risks in her life by anticipating every possible danger and always expecting the worst. 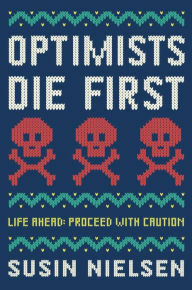 Pessimists, she argues, live longer than optimists. No amount of arguing from her parents or counselors will dissuade her. But she isn't just overly cautious, her behavior leads to paralyzing fears of change or novelty in her life. Then she meets the "Bionic Man," Jacob, a guy with a prosthetic arm and a secret grief which is eating him just as much as hers. And Petula finds that, as much as she tries to anticipate anything that can go wrong, she can’t control others or the leanings of her own heart. On the surface, this story about a young woman with an anxiety disorder from Vancouver is strikingly similar to the last book I read. But when you move beyond those surface items, the novels couldn’t be more different. Nielsen’s book is more entertaining, but also more superficial. Her characters are pleasant but not terribly deep. Perhaps the contrast is best illustrated by the running gimmick that each author uses. In 10 Things I Can See From Here, the protagonist Maeve is constantly drafting hypothetical obituaries, which underscore her fears of death, dying, and being left behind. Here, it is Petula’s scrapbook of bizarre deaths (death from watering flowers, being crushed by a cow, etc. ), which seems more intended to elicit laughter. In the end, Petula’s phobia are easily resolved, while Maeve’s struggle with anxiety is more of a battle and that story ended with a note of unresolved hope. Nielsen's optimism seems misplaced.